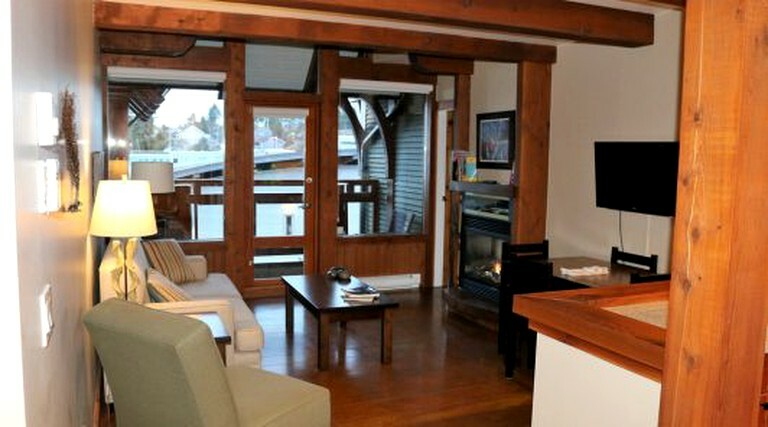 This waterfront suite is located near Long Beach, British Columbia, and can accommodate four guests for a revitalizing getaway to Vancouver Island's rugged western coast. It consists of one bedroom, two full bathrooms, a living/dining room, and a kitchen. 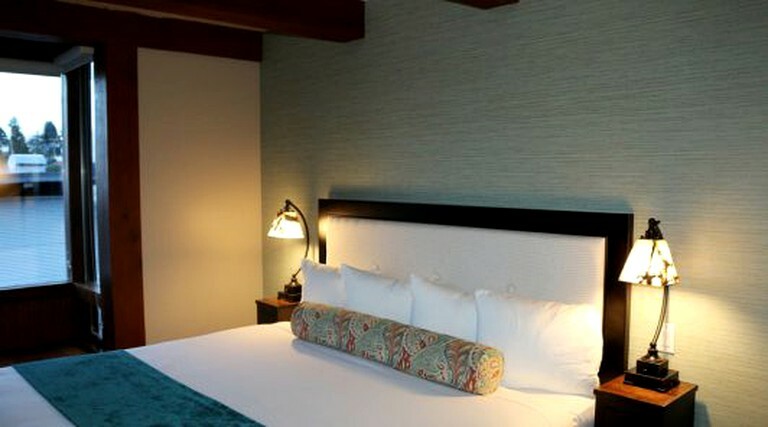 The bedroom is furnished with a king-size bed flanked by nightstands with bedside lamps. 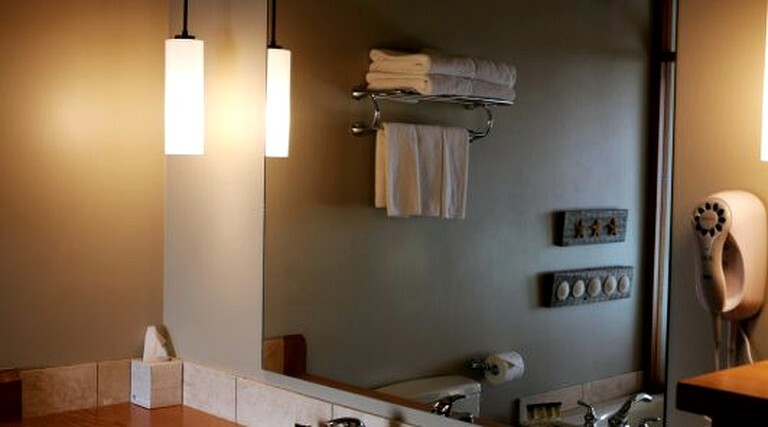 In each of the bathrooms, guests will find a jetted bathtub and a separate shower. 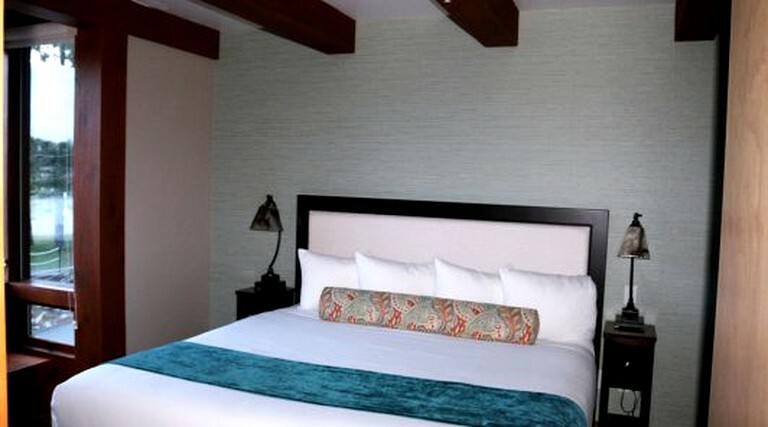 High-quality linens and towels are provided. 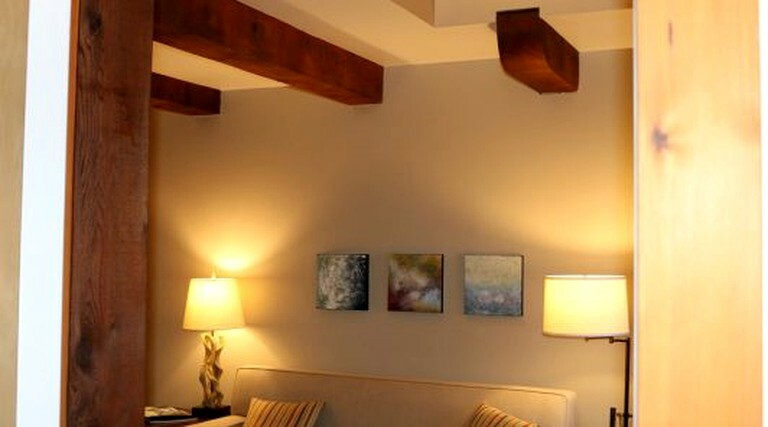 In the living/dining room, guests will find a double sleeper sofa, a gas fireplace, a wall-mounted flat-screen television, and a four-person dining table. 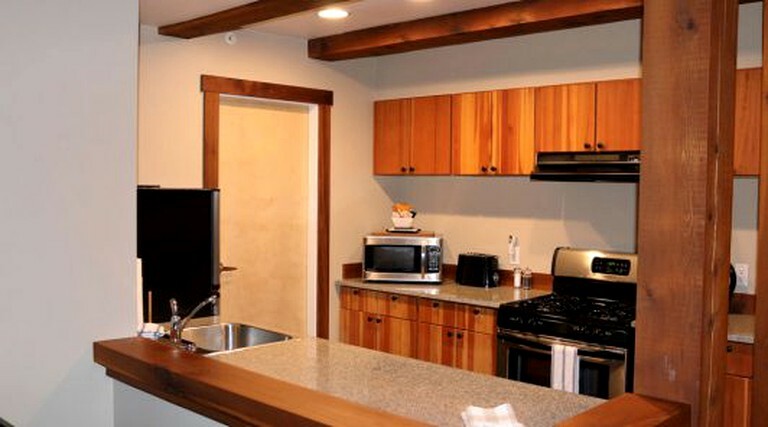 The fully-equipped kitchen comes with an oven, a stove, a microwave, a refrigerator, and a coffeemaker. 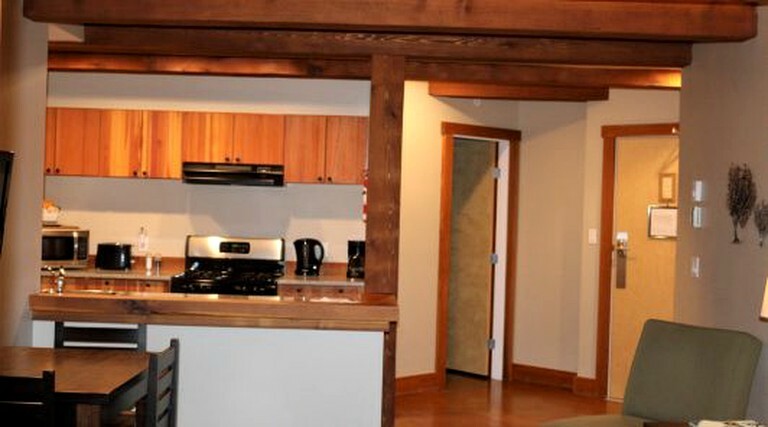 This accommodation is located at a lodge in Ucluelet, British Columbia, where it is situated on the waterfront of the town's harbor. 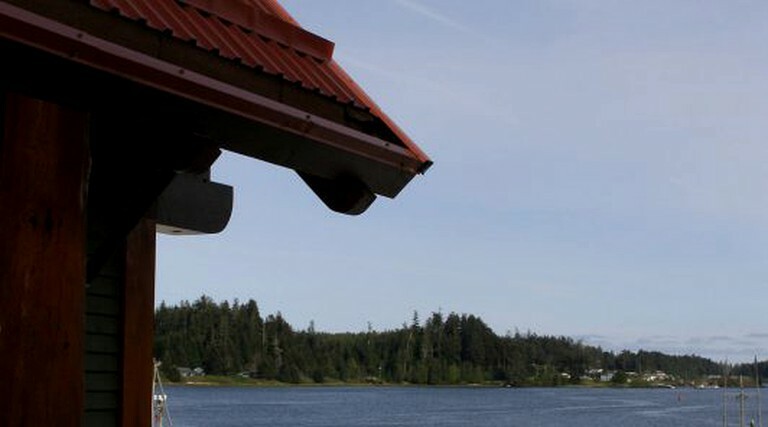 From the windows of the accommodation, guests may spot eagles in the air above, bears and deer on the shores beyond, and sea lions and orcas in the seawater below the lodge. 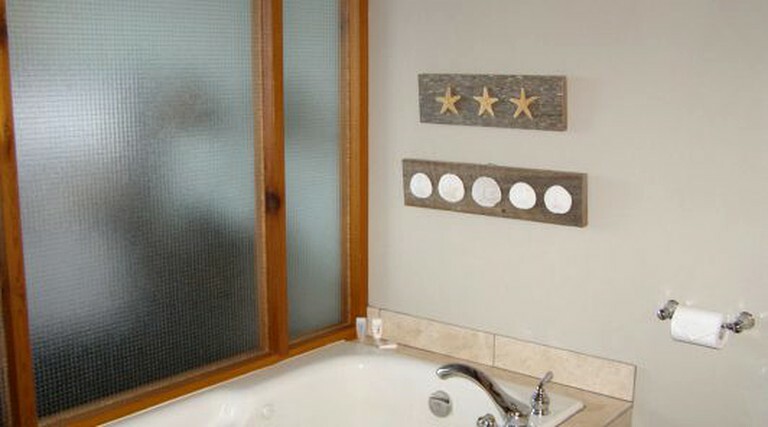 Right next door to the lodge, guests will find the Ucluelet Aquarium, where they can see local marine life up-close, and the Whiskey Landing Marina, where Archipelago Wildlife Cruises and West Coast Wild Adventures are based. The town's restaurants, cafes, galleries, and grocery store are all within walking distance of the lodge. About 6.5 kilometers to the north, guests will find the Long Beach Unit of the Pacific Rim National Park Reserve, where a network of trails winds through forests of cedars and hemlocks. The park also boasts the most extensive area of sand dunes and beaches on all of Vancouver Island. Along the shore, guests will find rocky outcroppings that create tide pools, which they can explore up-close during low tide. 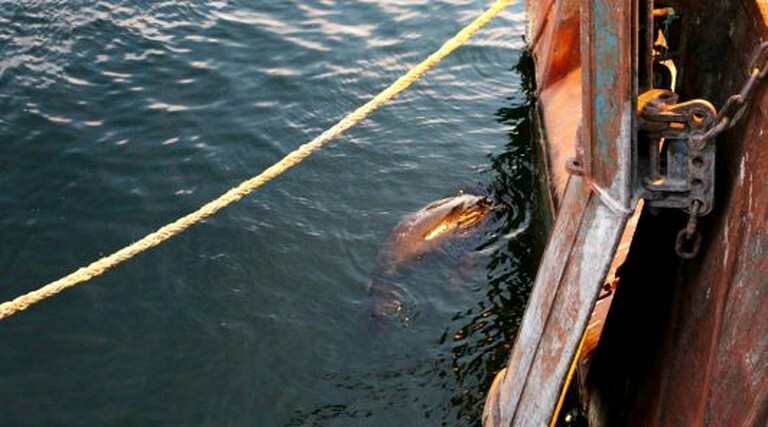 Off the shore, they will also find a bird nesting site and sea lion basking area known as the Sea Lion Rocks. Guests will find a variety of options for both land and water-based outdoor recreation on and around the Ucluelet Peninsula. For hiking, they will find a variety of loops and linear paths on the Wild Pacific Trail and the nearby Long Beach Unit of the Pacific Rim National Park Reserve. While hiking on the trail or in the reserve, guests will also have ample opportunities to enjoy wildlife viewing, birdwatching, sightseeing, and taking photographs of the area's rugged natural beauty. Bald eagles, great blue herons, seals, sea lions, and whales are just some of the birds and mammals guests may spot. To watch whales up-close, guests can head out to sea with local tour operators such as Archipelago Wildlife Cruises, which is based at the marina right next door to the lodge and can also take guests to the Broken Group Islands where even more incredible natural scenery and wildlife can be seen. To see local marine life species up-close, guests can visit the Ucluelet Aquarium, which is also next door. Other activities that can be enjoyed on the ocean include kayaking, sailing, surfing, diving, and fishing. Tours, rentals, lessons, and charters are available through a variety of local companies, such as Ucluelet Charters, Hello Nature Adventure Tours, Paddle West Kayaking, Long Beach Surf Shop, and West Coast Wild Adventures, the latter of which is based at the marina next door to the lodge. Other activity options on land include mountain biking on Ucluelet's logging roads and backcountry trails, cycling from Ucluelet to Tofino, golfing at Long Beach Golf Course, and ziplining with West Coast Wild Adventures. For massages and spa services, guests can visit Nurture Day Spa or Waves 'N Shaves. For a meal, a drink, or a game of pool, guests can head to the Eagles Nest Pub. 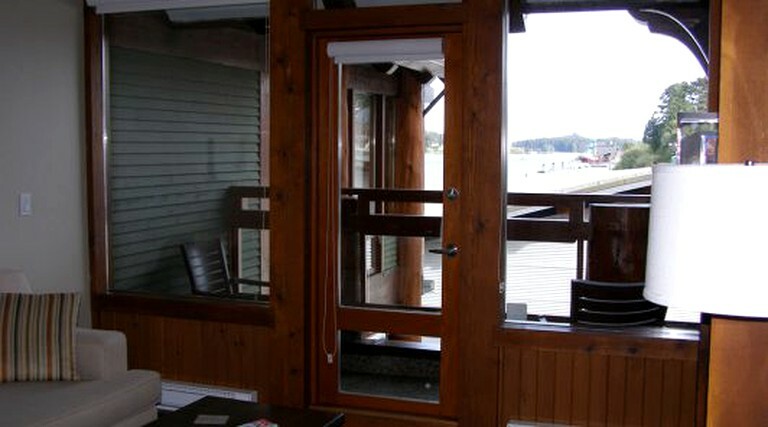 Other dining options in Ucluelet include the Cedar Grill, Hanks BBQ, Zoe's Bakery and Cafe, and Norwoods Restaurant. There is an additional cleaning fee.